- load up on borrowings for our grandchildren to repay. Not waving but drowning. The results look set to be much the same for both countries: the nastiest recession since the Great Depression - with a bank bailout thrown in for good measure. 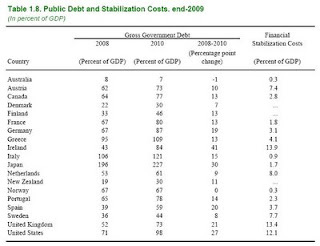 Below is the now infamous IMF table showing Ireland and the UK with the highest exposure to the banking crisis in terms of the final bill: nearly 14% of GDP in our case (ht Burning our Money). 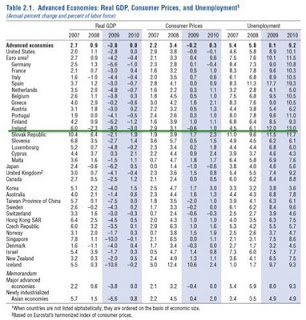 According to the IMF, Ireland will experience the most severe recession this year of all the countries they survey, except for Singapore and Iceland. Then it gets worse: Ireland is expected to experience the most severe recession of all the countries in the IMF forecasts - period. Even Iceland is expected to do better next year than Ireland. Our forecast contraction in GDP of -3% in 2010 is the price we are paying for our government's curious ambition to put the economy in hock in order to bailout the banks. I hope they're worth it. Great blog. I actually think it is one of the best in Ireland right now and I love reading it. You vast range of reference points and your wide array of knowledge never ceases to impress, even though I disagree very strongly with your increasingly antiquated economic views,especially your unwavering belief in Hayek/Friedman/Greenspan free market orthodoxy which is surely intellectually and morally bankrupt. Just a point of clarity on this article. You echo a similar sentiment that the Daily Mail/Telegraph/Times are uttering, which is that Alistair Darling's budget represents an assault on Middle England. The most contentious point is the increase from 45% to 50% in taxation on those that earn £150,000stg a year or more. It is factually incorrect to refer to this group though as "middle class". They are actually in the upper echelons of wealth in England today. Polly Toynbee elaborated on this point in The Guardian today. "The 1.5% who earn over £100,000 will yet again claim an assault on "middle England"...............Wealth has lost touch with reality: however often the rich are reminded that 98.5% of people don't earn £100,000 and only 10% earn over £40,000, they insist they are only "ordinary" and "middling". Governments have very little scope for dampening the effects of the collapse of the global financial markets and the ensuing global depression (yes depression) as governments were made subservient to rapacious neoliberal capitalism a long time ago. Such emergency budgets are akin to putting a finger in the proverbial dam. Regardless of what they will do, we are all going to drown. Admitedly Brian Lenihans budget was remarkably unimaginative and ineffective. Paul Krugman wrote about it in the New York times last week. Worth reading and he is a fantastic economist. Check out Dean Baker too, one of the few to predict the credit crunch. Well in fairness to the British. only those earning over 125,000 will see a reduction in their take home pay. Not exactly middle earners. as will points out. Fair point about the British middle classes and the recent UK Budget Will. I forgot they are already being screwed by their Government: and paying levels of income taxes on average earnings and below that are far in excess of even the latest squeeze from our Department of Finance.